30% nuts. Sweetend with honey. 6g natural protein. Gluten & wheat free. Absolutely no grains (like oats), refined sugars or vegetable oils. Absolutely no artificial preservatives, colours or flavours.x3 More Nuts? vs Other Nut Granola ? 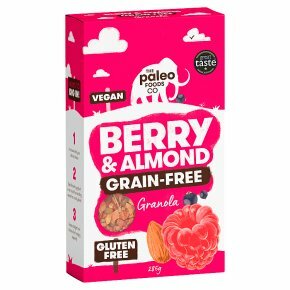 Contains a minimum of 80% more nuts per 100g compared to any other nut containing granola in the UK, which typically contain 5%-16% nut content. Ah, those good old cave days. Way back then you'd have to forage at the crack of dawn for a breakfast as naturally delicious as this. Today? Take your time, potter about and read the paper, because we've done all the picking, preparing and crafting for you. Our tasty granola isn't your average. It's made to Paleo principles - that's with no grains (like wheat and oats) or refined sugar. Instead, it's packed with a mammoth amount of toasted nuts, crunchy seeds, coconut chunks, tangy berries and a drizzle of honey. So every bowl gives you a generous 6g helping of protein, only 7.2g of carbohydrates per serving - and (best of all) heaps of flavour. Ways to dig in! Enjoy with your milk of choice, or on its own for an energyboosting snack (no foraging required).